What is the Performance and Health Optimization Center? 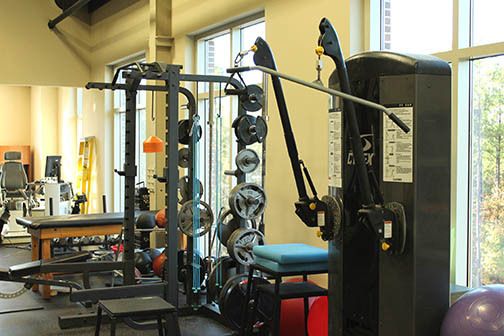 The School of Kinesiology’s Performance and Health Optimization Center at Auburn University is a compilation of research laboratories, outreach programs, and individualized assessments designed to help people achieve maximum outcomes in health, fitness, or sport performance. The Center is housed in the new Kinesiology building located at 301 Wire Road, and on the third floor of the MRI Research Center located at 560 Devall. The laboratories contain specialized equipment that facilitate research expertise to study the health and wellness of people of all ages and abilities, as well as the sport performance of athletes from youth to professionals. Faculty, graduate students, and undergraduate students in the School of Kinesiology in the College of Education conduct research to gather data about exercise adherence, movement of the body, brain cognition, thermal regulation, cellular function, and the effects of activity on the mind and body. Each of the 17 laboratories has an area of expertise to investigate animal and human physiology with real-world application. The Optimization Center also conducts a number of outreach programs. For example, a child motor learning program provides preschool children from Loachapoka a fun environment to move and play twice a week. The children enjoy being physically active while students and researchers gather data to understand how children learn motor skills and what motivates young people to move. Another outreach program is the Cancer Survivors Tai Chi Program designed to improve motor control, mindfulness, and balance. Scientists in the Rehabilitation Biomechanics Lab measure the beneficial effects of this gentle, martial-arts practice on rehabilitation. This program utilizes the gym space in the MRI Research Center. The Kinesiology faculty also utilize the MRI machines at the MRI Center to analyze data as part of their research. The Center partners with the East Alabama Medical Center, Rehab Works physical therapy, and many Colleges within Auburn University — including engineering, sciences, and veterinary medicine — to improve healthcare through advanced magnetic resonance imaging. One recent collaboration with the School of Kinesiology involved imaging and measuring cardiac remodeling and mechanical function, and evaluating techniques for diagnosing and treating cardiovascular disease. The Cardioprotection Research lab in the School of Kinesiology uses a rodent model to study ischemia-reperfusion injury, or heart attack damage, and how to prevent it. The Optimization Center also provides health and biomechanics assessments for individuals. The TigerFit program conducts health and fitness evaluations and provides exercise prescription. The assessment includes a cardiovascular disease risk assessment, cholesterol and blood glucose screening, assessments of pulmonary function, body composition and bone mineral content, a graded exercise test with ECG for aerobic fitness, muscular strength and endurance, flexibility and a musculoskeletal evaluation. Clients receive their results and an individualized exercise prescription designed to help individuals start an exercise program. In addition, three labs in the School of Kinesiology provide biomechanics assessments, including upper body throwing techniques and lower body gait analysis. They provide scientifically-based recommendations to improve softball pitching, running technique, and even shoe tying methods. These services are provided to participants through research studies and to the general public for a reasonable fee. For inquiries about personalized assessments, email Kristin Roberts, Coordinator of Performance and Health Optimization. You may want to schedule a Tiger Fit appointment. For more information about the MRI Research Center or to discuss collaborative research utilizing MRI technology, call (334) 844-6747 or email Ron Beyers, Research Engineer.